Antrim moved to the top of Division Four of the Football League as Matthew Fitzpatrick's late goal helped them beat Wexford 1-8 to 0-7 in Belfast. 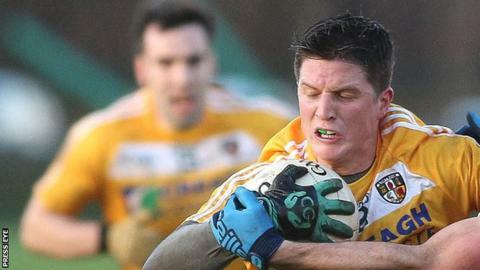 Four Tomas McCann points contributed to Antrim's 0-7 to 0-4 lead at half-time having played against the wind. A Niall McKeever point extended Antrim's lead but Fitzpatrick's injury-time goal was their only remaining score as Wexford fought back. Antrim lead the table on points difference from Louth and Wicklow. The Saffrons went into the game after their opening 1-12 to 0-10 win in Carlow and while their second-half performance was unconvincing, the victory puts them in a very good position to maintain a promotion challenge. Points from James Laverty and McCann gave Antrim an early 0-2 to 0-0 lead at Corrigan Park before Donal Shanley and Ben Brosnan replied to level the contest. Antrim lost Justin Crozier because of a leg injury midway through the opening period but the Saffrons hit five of the remaining seven scores before the interval with McCann on target on three occasions. Niall McKeever's second score of the game after the restart appeared to have given Antrim breathing space but the Saffrons were held scoreless for over 30 minutes as three Shanley frees cut their lead to the minimum. However, McCann's brother Michael set up Fitzpatrick's injury-time goal to confirm a vital win for the Saffrons.